The sandy soils of Florida are prime habitat for our only tortoise, Gopherus polyphemus. Gopher tortoises thrive in many of our ecosystems, pine-oak sandhills, oak hammocks, prairies, flatwoods and coastal dunes. 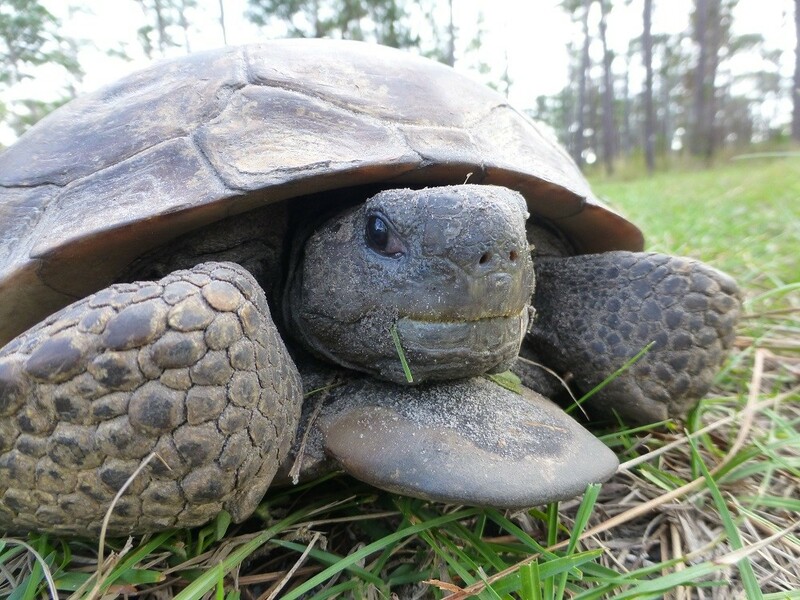 In order for a gopher tortoise to thrive it needs loose, sandy soil in which to burrow, adequate low growing plants for food, and sufficient sunlight for incubation of its nest. 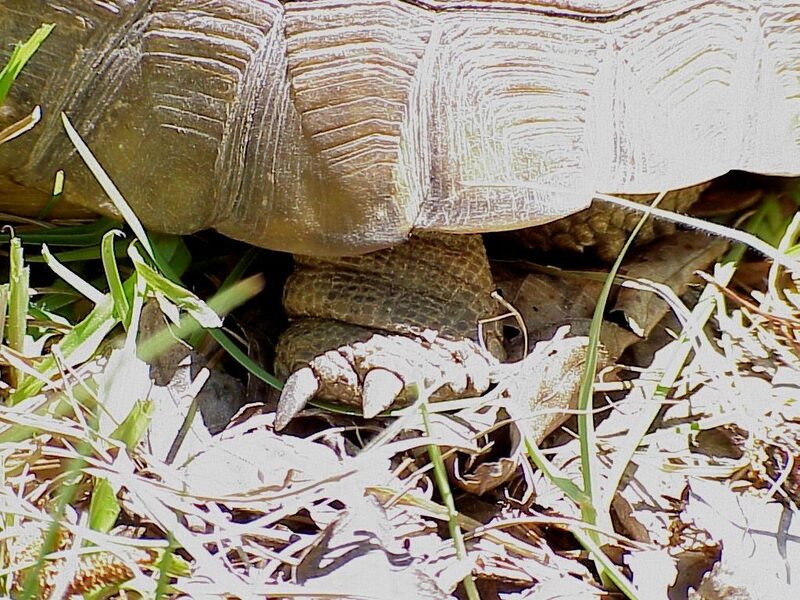 Gopher tortoises require loose, sandy soil for digging their burrows. Their burrows run laterally underground for 30 to 40 feet, and to a depth of up to 18 feet – ending in a den. The burrow itself is as wide as the length of the tortoise so that it is able to turn around anywhere within its burrow. Along with the tortoise, these burrows provide shelter, and are shared by a number of other animals, such as the Eastern Indigo snake, pine snake, gopher frog, Florida mouse, rabbit, quail, armadillo, burrowing owl, and gopher cricket. A number of these animals, the gopher frog, the Florida mouse, and the gopher cricket, live most of their lives within the burrows, and would not survive without them. 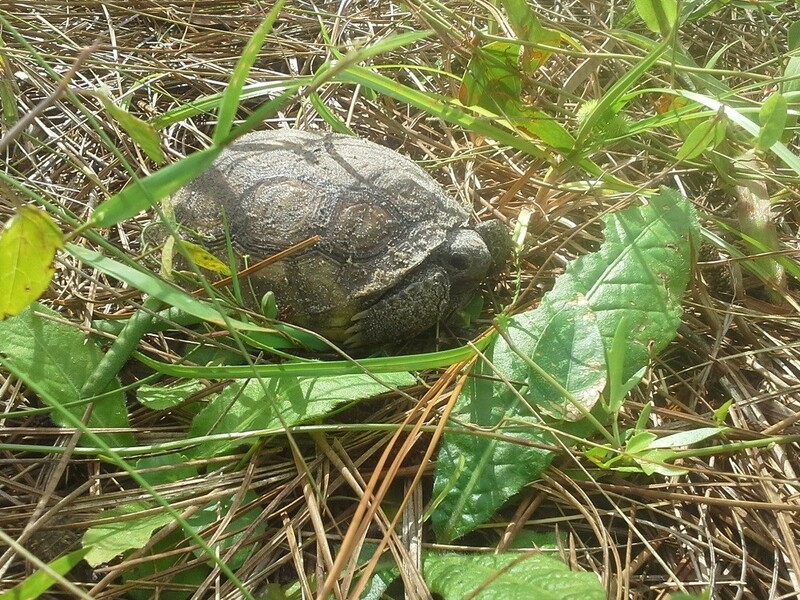 Gopher tortoises feed on low-growing plants and their fruits. Their main diet consists of wiregrass, broadleaf grasses and legumes. They also eat the fruits of gopher apple, saw palmetto, prickly pear cactus, pawpaw, and blackberry. The area surrounding a burrow usually has a network of well worn paths which the tortoise uses daily for foraging. The vegetation found on these paths is neatly trimmed by the tortoise, which in turn encourages the production of new growth of its favorite plants. Female tortoises reach reproductive maturity at around ten years of age. At this age the shell length is approximately nine inches. Courtship begins in early spring and includes head bobbing, nipping and chin rubbing. Nesting takes place in April to July. The female uses the mound of dirt in front of her burrow in which to lay her eggs, which is usually 3 to 15 in number. Incubation is generally 80 days from laying. Sadly, most of her eggs are lost to predation. Many mammals, including raccoons and skunks, find the eggs and the hatchlings an irresistible food source. Because of the high loss to predators researchers believe that survival of hatchlings may only occur once in every ten years. It is believed that the hatchlings live out there first winter in the female’s burrow eating her dung for sustanance. The next year they dig their own burrow. The gopher tortoise is a keystone species and if allowed to become extinct will cause many other species to become extinct as well. The gopher tortoise plays an important role in its harsh Florida ecosystem by making it an acceptable place for other animals to live in. Conservation of the tortoise’s habitats and the native plants which thrive there is much needed for the survival of the gopher tortoise. The greatest threat to their survival is loss of habitat to development. Gopher tortoises are protected by law in Florida and are listed as a Threatened Species.